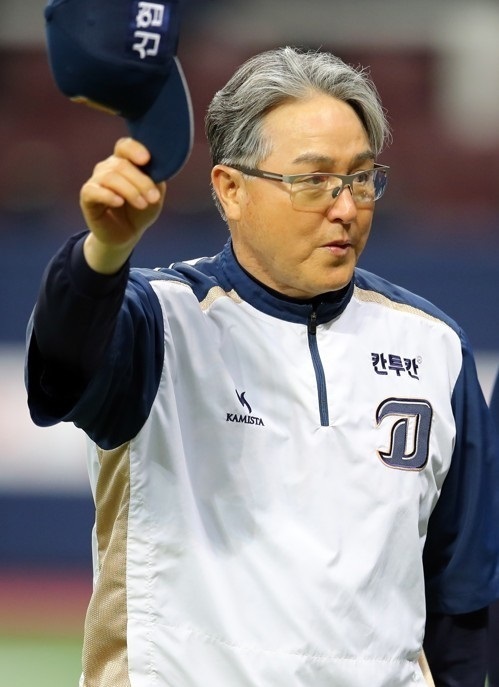 South Korean baseball club NC Dinos said Thursday their manager Kim Kyung-moon, recently diagnosed with a benign brain tumor, has been discharged from hospital. The Korea Baseball Organization club said Kim will be resting at his home and will remain sidelined indefinitely. Kim, 58, left last Friday's game against the KT Wiz in Suwon, some 45 kilometers south of Seoul, with dizziness and symptoms of acute indigestion. He was admitted to a hospital in Bundang, near Suwon. The Dinos then announced Tuesday that Kim was diagnosed with a small tumor in his pituitary gland. The condition didn't require surgery, but Kim has been advised to rest. Kim's condition has improved and he will be re-evaluated four weeks later, according to the Dinos. In his absence, bench coach Kim Pyoung-ho has been handling managerial duties. The Dinos are in second place in the 10-team KBO with a record of 58-39-1 (wins-losses-ties), five games behind the league-leading Kia Tigers.